I've collected several quilting patterns with Westies or terrier-like dogs (including some Scotties) as the main theme. Even though I'm not a real quilter, someday I plan to sew at least a couple of Westie quilts or wall hangings. So, similar to my list of Westie machine embroidery links, I'm starting a page just for quilting patterns I like or have purchased, to help me keep track of my "collection". I also have a Westie and doggie fabric collection photo album, updated every once in a while when I find something new. Gone to the Dogs - judydidit designs > [the links to this seem to be broken - a google search yields lots of vendors offering this pattern] nine playful doggies in various colors, some with pointy terrier ears and some with floppy ears, and a variety of tail shapes. Could be adapted to feature almost any breed! Doggie Diaries Quilt Pattern - Block Party Studios, Inc. > This could be made for any breed, not just Westies; pattern comes with a printed fabric panel with quotations and sayings. Small Dogs > Designs for Machine Appliqué - traditional appliqué, not digitized for machine embroidery. Quilt design for a dozen small dogs, with the Westie right in the middle from Critter Pattern Works. They also have another pattern available featuring a Westie design, Dogs 1 pattern. West Highland White Terrier Portrait (a head study), West Highland White Terrier (with defined pointed ears) and West Highland White Terrier (with rounded head style) designs by Linda Hibbert available from SilverLiningsOriginals.com. The Canine Corner page has patterns for all AKC dog breeds, some mixed breeds and commissioned portraits; worth a visit to this site just to see each of her AKC breed group quilts! Makower UK Ltd has a free PDF download: Woof! In Da House featuring terrier-like dogs in houses. Probably intended to be Scotties, but could be made as white Westies. 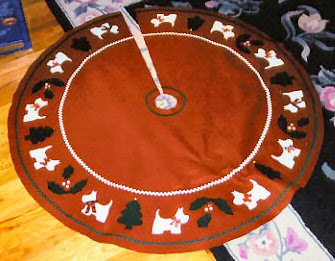 This isn't a quilt, but here's a photo of a Westie Christmas tree skirt I made from craft felt, rick-rack, buttons and glue. (This is a scanned image of the original photo, so some of the colors are off). Every year when I put up the Westie Christmas tree (in addition to our main Christmas tree), this goes under it and I always think that I should add some hand stitching to it, but now it's about 10 years old and starting to come apart. It should probably be replaced - maybe a quilted skirt is in order. Doesn't everyone have a special Christmas tree just for their Westies? I need a special tree just for my westie! And that tree skirt is just gorgeous... I love your site not only for the inspiration you provide but also because I am a fellow human owned by a westie--and I'd have it no other way!